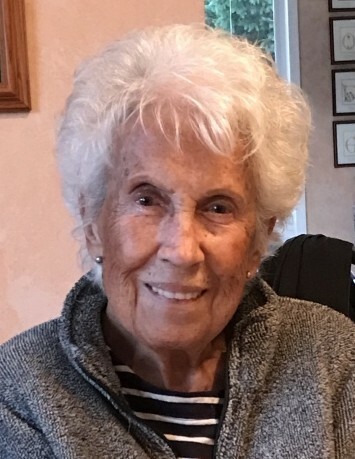 Calliroye Jymette Bonnivier, 91, Sturgeon Bay, died peacefully in the comfort of her home, Tuesday morning, December 4, 2018 with her husband, Herbert, at her side. She was born November 14, 1927 in Chicago, IL, the daughter of James Gus Kallas, Sr. and Lillian C. (Pulaski) Kallas. Calliroye “Cal” graduated from Kelvyn Park High School on the northwest side of Chicago in 1945. She was united in marriage to LeRoy Patrick Bonnivier, whom she had known since high school, on August 2, 1947 in Chicago. Cal raised her family and went on to study art education and earn her Bachelor of Arts degree from Northeastern Illinois University after her children were grown. 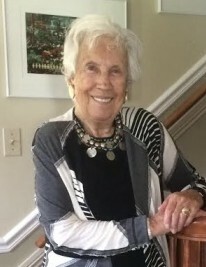 She was an established artist whose work was featured in galleries in the Chicagoland area, prominent collections including Oprah Winfrey’s, and later throughout galleries in Door County, WI. Cal and LeRoy shared nearly 44 years of marriage together. LeRoy passed away January 9, 1990. She married a long-time family friend, Herbert Henry Klein, on July 12, 1992. Cal and Herb moved to Door County, WI later that year and have resided there ever since. She attended St. Mary’s Catholic Church in Des Plaines, IL after marrying LeRoy and later attended Hope United Church of Christ while living in Sturgeon Bay. Calliroye was a former member of the Des Plaines Art League and a member of the Door County Art League, and in 2013, she received the Master Artist award through the Door County Art League. The words most often used when describing Cal’s work are “soft, sensitive and lovely in color.” Impressionistic in expression…an emotion, a fleeting glance, or nuance of color can best explain her paintings. She felt no need to “say it all” and would rather the viewers bring something of themselves to her work. She wholeheartedly embraced the words of Ralph Waldo Emerson, “Though we travel the world over to find the beautiful, we must carry it with us or we will find it not.” She agreed with Renoir that the world is filled with enough disagreeable things without an artist contriving still more of them. Though she studied art for years in and out of school, most of her techniques are innovative and self-taught. She continued teaching her grandson, Colton, a rapidly emerging artist, in her final days. Cal was also a member of P.E.O., a North American women’s organization. She will be remembered for being a generous, kind, and loving person who had an ability to see the beauty in people, in art and in nature all around her. Cal definitely emulated beauty from the inside out. Cal’s love will live on in the hearts of her husband, Herbert Klein of Sturgeon Bay, with whom she shared over 26 years of marriage; Cal’s three sons and two daughters, Marc (Beth) Bonnivier of Palatine, IL, Guy Bonnivier of Bellevue, ID, Bernadette (R. Michael Meyer III) of Sequim, WA, Brad (Janice) Bonnivier of Weaubleau, MO, and Jymette (Randy) Seager of West Chicago, IL; Cal’s eleven grandchildren, Brett, Matthew, and Bart Bonnivier, Dr. R. Michael (Danielle) Meyer IV and Jymette (Bryant) Watrous, Callie (James) Fenby and Levi (Christine) Bonnivier, Ryan (Jenna), Colton (Ruthie), and Ty Seager; Cal’s nine great-grandchildren, Nolan, Emmett, and Asher, Gabe, Ava, and Olivia, Vivian and Royce, and Clayton; Herbert’s four daughters and three sons, Donna Murphy, Liz (Robert) Klein , Peggy (Jim) Brodeur, Jack Klein, Carrie (Bill), David Klein, and Eddie Klein; Herbert’s daughter-in-law, Buffy Klein; Herbert’s grandchildren, Brita and Kate, Jesse and Brendan, Chandra, Brian, Tim, and Maureen, and Halley; Herbert’s great-grandchildren, Morgan, Charisse, Sienna, Trey, and Jimmy; Cal’s two brothers, Dr. James (Darlean) Kallas, Jr. of Thousand Oaks, CA and Elwood (Betty Lou) Kallas of Maryville, TN; Cal’s sister-in-law, Bernadette Kallas of Brussels, Belgium; other relatives, and friends. Cal was preceded in death by Cal’s parents; Cal’s first husband, LeRoy Bonnivier; Cal’s grandson, Luke Bonnivier; Herbert’s son, Herb Klein; Herbert’s grandson, Colin Murphy, and Cal’s brother, Dr. Gerald Kallas. A celebration of Cal’s life will be held at 11:00 a.m. on Saturday, January 19, 2019 at Chicago Botanic Garden, 1000 Lake Cook Rd., Glencoe, IL 60022. Memorials may be given in Calliroye’s honor to Feed My People or Door County Land Trust. Huehns Funeral Home in Sturgeon Bay is assisting the family. Expressions of sympathy, memories, and photos of Cal may be shared with her family through her tribute page at www.huehnsfuneralhome.com.